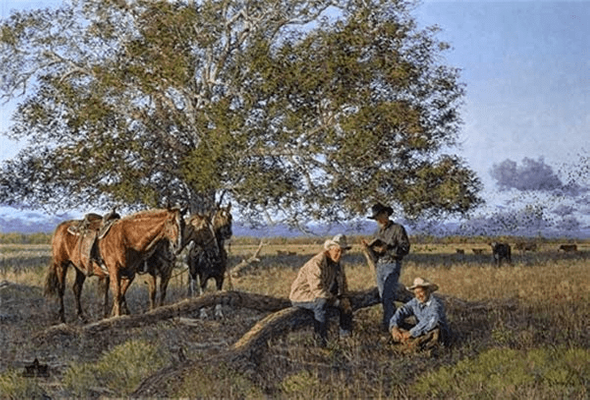 Bradley Schmehl Handsigned and Numbered Limited Edition Giclee on Canvas:"Cowboy Church"
Image size:: 27" x 40"
About the Artist : Brad Schmehl is an artist with a love of history and a passion for the Civil War. Today Brad and his wife Becky live in an 1885 Victorian home in Pennsylvania. Ideas for paintings come to the artist through reading history books, the diaries and letters of soldiers, visiting battlefields and historical sites, and most importantly, talking and exchanging ideas and information with the many interested and interesting people who share his sense of history.